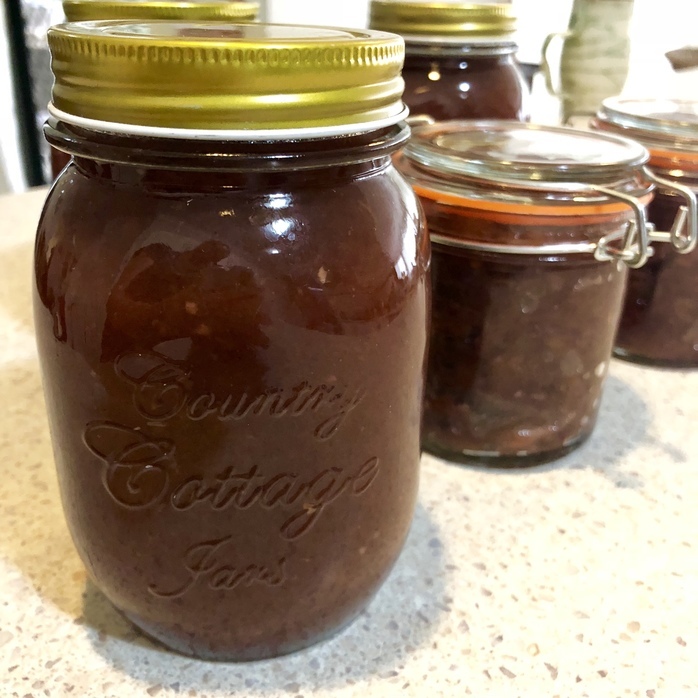 This great recipe makes both a flavoursome chutney and an amazing plum sauce. Use the chutney on a cheese platter for that wow factor or as a great accompaniment for roasted meats. The sauce goes really well on burgers or in stir fries. If you have the time, it is well worth the effort. Remove stones from plums and quarter roughly. Peel, core and roughly chop apples. Add all listed ingredients and combine well in a large pot. Bring to the boil then reduce heat and simmer gently until the fruit has completely softened and the liquid has reduced to a thick sauce. This took approximately an hour and a half… but will depend on size of your pot and temperature your stove is at. Allow to cool slightly then push ¾ of mix through a course sieve. What goes through the sieve is your plum sauce. The remaining ¼ is your chutney. I like to mash it lightly, but leave it whatever consistency you prefer. Spoon/pour into your sterilised jars. Allow to cool then store in the fridge. Will last sealed in fridge for 3-6 months.